It seems to me that Donut Muffins got the short end of the stick in name and appearance. While both are adequate and perfectly nice, neither fully convey the extent of this sweet’s amazingness. And trust me, they are amazing. Imagine a magnificently moist muffin with a most delicate crumb. Then, paint it with a luxurious coat of rich melted butter. Lastly, roll it about in a bowl full of sugar. Now, take a bite. Pure heaven, right? Buttery lips, sugary fingertips, and all! This delightful recipe comes courtesy of Baking Bites and G-Ma’s Bakery. Since The Astronomer loves warm spices, I upped the amount of nutmeg and cinnamon a good amount—the recipe below reflects these changes. Donut muffins taste best served hot from the oven, but if there happen to be leftovers, a quick nuke in the microwave will recapture the freshly baked magic nicely. Donut muffins may not have the cache and pizazz of say, Caramelized Bacon and Salted Caramel Bread Pudding, but they are definitely worth your while. Preheat oven to 350° F. Lightly grease a standard muffin tin with cooking spray, or, using a pastry brush, coat muffin cups with vegetable oil. 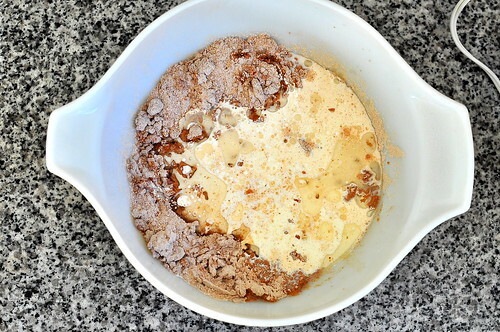 In medium bowl, whisk together flour, unsweetened cocoa powder, baking powder, salt, nutmeg, and cinnamon. In a large bowl, using an electric mixer, beat together sugar and egg on medium-high speed until light in color, approximately, 15 to 20 seconds. Add the flour mixture to the sugar mixture in three batches, incorporating as well as possible after each addition using a rubber spatula. The final result will be unappealingly dry and hairy. Add the vegetable oil, milk, cream, and vanilla extract. 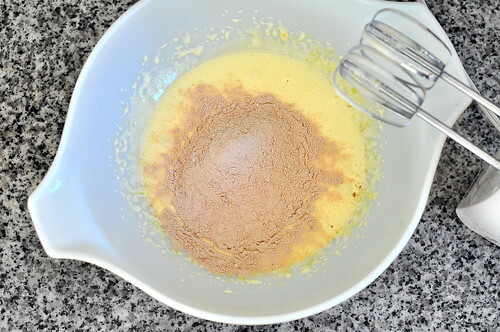 Beat until just combined using an electric mixer—be sure not to over-beat the mixture. 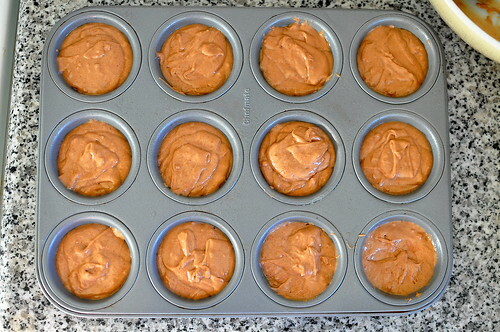 Divide the batter evenly into the muffin tins, filling each about 3/4 full. Bake for 15-20 minutes, until a tester inserted in the center comes out clean. 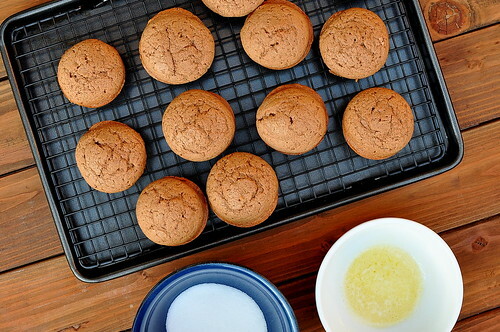 While muffins are baking, melt butter over low heat in a small saucepan, and pour remaining sugar into a small bowl. Let muffins cool slightly in the pan for a minute, then carefully remove and place on wire rack. 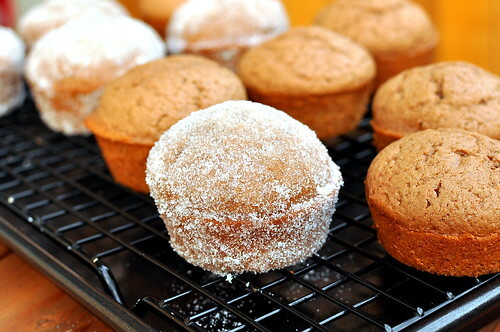 Lightly brush the top, sides and bottom of each muffin with melted butter and roll in sugar. Cool completely on a wire rack. 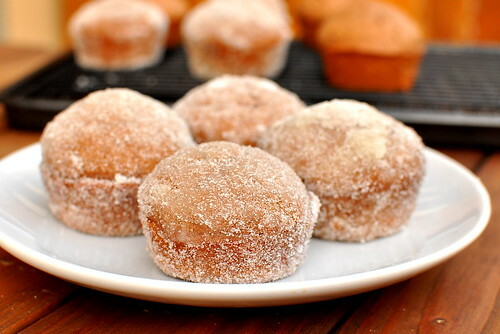 I’ve been a bit wary of doughnut muffins in the past, but you may have convinced me to give them a try. These look delicious! Looks delish! Wish I had one this morning! I think the best part of a donut is the soft hollowish but not too hollow (if that makes any sense) inside. Will the donut muffin have the inside of a muffin? Cliff – For an idea of what the innards are like, take a look at the final picture that I posted. 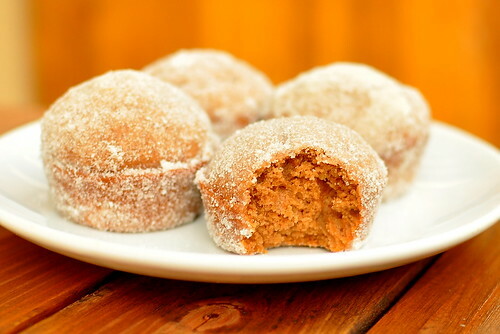 Donut Muffins are not as airy and light as yeast doughnuts, but something about the texture of the sugary crust coupled with the softness of the muffin that mimics a very doughnut-like experience. Sigh… oh donut muffins, a gift sent straight from heaven! Must make these soon! Are you seriously serious!? These look so crazy good! Funny I just read a post of a friends blog that has a similar idea of donuts in a sort of muffiny. Amazing! What novel idea, it sure beats deep-frying that’s for sure. Imagine put a blob of jam in the middle…jam doughnut! Thanks for sharing, I’ll have to give this recipe a try. Oh… so cute and yummy!!! Oh those look amazing! I made donut muffins once but wasn’t entirely enamored with the end result. Am guessing I just had the wrong recipe!